Mazda and Infiniti also win brand awards. Ford leads all manufacturers with six total awards. TORONTO, ONTARIO, CANADA, March 20, 2019 /EINPresswire.com/ -- The second annual Vincentric Best Certified Pre-Owned Value in Canada™ Awards were announced today, with Ford topping the charts with six total awards including the Best Value CPO Truck brand. Hyundai and Jaguar also performed well with five awards each, including the brand award in the Passenger Car and Luxury Car categories respectively. Other top performers were Mazda with four awards including the brand award in the SUV, Crossover, & Van category and Infiniti earning the brand award in Luxury SUV & Crossover category. Toyota and Audi also had multiple Best CPO Value in Canada awards, while Acura, Chevrolet, Honda, Nissan, Subaru, and Volvo each had one model-level winner. 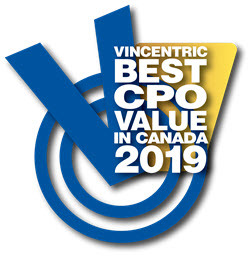 To determine the 2019 Vincentric Best CPO Value in Canada™ award winners, Vincentric conducted a statistical analysis to reveal which vehicles had lower than expected ownership costs given their market segment and price. Vincentric analyzed over 13,000 vehicle configurations using eight cost factors: depreciation, fees and taxes, financing, fuel, insurance, maintenance, opportunity cost, and repairs. The costs were measured after incorporating the specific CPO warranty offered by the manufacturer while also applying driving distance requirements necessary to be authorized as an OEM CPO vehicle. Each CPO vehicle was evaluated in all ten provinces plus the Northwest Territories, with the assumption that each vehicle is driven 20,000 kilometers annually over five years. Further information regarding all the winners of the Vincentric Best CPO Value in Canada™ Awards and the Vincentric methodology is available at www.vincentric.com. Vincentric provides data, knowledge, and insight to the automotive industry by identifying and applying the many aspects of automotive value. Vincentric data is used by organizations such as CAA, AOL, Business Fleet Magazine, Chevrolet, Mercedes-Benz, and Toyota as a means of providing automotive insight to their clientele. Vincentric, LLC is a privately held automotive data compilation and analysis firm headquartered in Bingham Farms, Michigan USA.